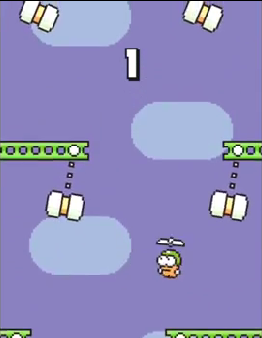 Swing Copters for PC: While you were still stuck playing Flappy bird and trying to break the high score, Dong Nguyen who developed the game which gave him success and lot of fans from around the world recently launched Flappy bird Family, a multiplayer game for Amazon fire TV. Now Dong Nguyen is back with his new Game called "Swing Copters" to make us go crazy and mad by taking the difficulty of gameplay to a new level like never before,so get ready to rock n roll because the swing copters game will be available on Google play and iTunes on 21 August. 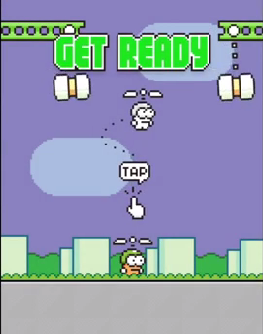 Both "Flappy bird "and "Swing Copters" are closely related in terms of gameplay and graphics, The Flappy bird is a horizontal scrolling game in which the bird flies where our goal is to score as much as we can by avoiding the obstacles (Mario Pipes).Swing Copters game is a 2D flying game, as the name "Swing Copters" suggests there is character which has a propeller(copter) like hat, our goal is to avoid the swinging obstacles and fly as much as we can to make and the break high score. After installing, open Bluestacks and search for "Swing Copters" and install to play the game. If you can't find the game from the search tab then, you can download Swing Copters APK and open it using Bluestcks app player.